S M Ong: Why is MediaCorp telling us to turn off the TV when we already have? Why is MediaCorp telling us to turn off the TV when we already have? 1. Is people not turning off their TV when they're not watching really such a big problem? The story is about how people should reduce energy consumption at home. I think it's more common now for people to leave their computers on when no one is using them. At least that's the case in my home. 2. I hardly even turn on the TV anymore these days. I watch almost all my TV shows on the Internet. 3. Today newspaper is owned by MediaCorp, which is also in magazines, radio, movies, events, outdoor and what have you. But its mainstay is still the TV business. 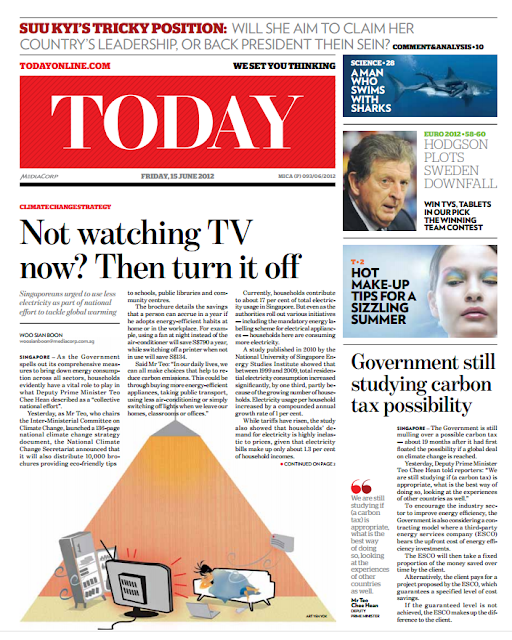 So why is MediaCorp telling people to turn off the TV? It's like Singapore Press Holdings telling people to put down the newspaper. 4. And most ironic of all, TV is not even mentioned anywhere in the story apart from the headline! I think someone just came up with the headline to go with the cartoon.